Pure aggression. That's how Layne Flack took his sixth WSOP bracelet in Event No. 34, the $1,500 Pot-Limit Omaha with rebuys event. After some early jockeying, Flack and eventual fourth-place finisher Dario Alioto edged out ahead of the rest of the pack. Then once Flack took a big pot off of Alioto, Flack put his foot on the gas and never let it up until all the chips were his. Frank Vizza, who had led most of Day 1 and part of Day 2, couldn't get anything going and went out in ninth. Tim "Tmay420" West, the short stack coming in, only played two hands of note, and on the second he, too, was sent to the rail. 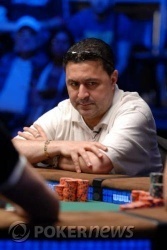 WSOP newcomer Michael "TheBigSiCkO" Guzzardi had the misfortune of sitting in between Ted Forrest and Flack. He hung on, surviving multiple all ins, before going out in 7th. Kyle Kloeckner was impressive throughout the event, but a couple of tough hands sent him out. He was followed by a short-stacked Ted Forrest. 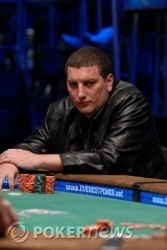 Dario Alioto, briefly the chip leader tonight, followed Forrest in fourth. Jacobo Fernandez went out in third, securing his spot at the top of the current WSOP Player of Year points race. Flack had a huge 6-to-1 chip advantage over Daniel Makowsky when heads up began, and within a half-dozen hands it was over. Flack had rebought at least 20 times during the frenzied rebuy period on Day 1, perhaps the most of any entrant. That $30,000-plus was obviously well-spent, though, as Flack takes home a cool $577,725 for his efforts tonight. One could sense a mixture of elation and relief on Flack's face when it was over. "It's been five years," he said, alluding to the gap since his fifth WSOP bracelet. "I want to savor it a little bit." Congratulations to Flack and all of those who made the final table. And thanks to all for following the coverage! Layne Flack raised pot from the small blind/button, Makowsky reraised pot, Flack reraised enough to put Makowsky all in, and Makowsky made the call. The flop came . Flack's kings were still good, but Makowsky had picked up a diamond draw. The turn was the . Makowsky needed a diamond or an ace. 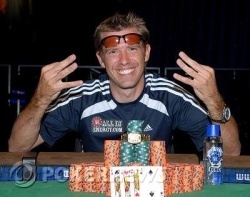 The river was the , giving Layne Flack his sixth WSOP bracelet and the $577,725 first prize. Daniel Makowsky takes $355,050 for second. Makowsky limped, and Flack checked. The flop came . Flack checked, Makowsky bet 75,000, and took the pot. Flack got a walk, then Flack raised and took the pot. Daniel Makowsky has the small blind/button. Makowsky limped in, and Flack checked. Both checked the flop. The came on the turn. Flack checked, Makowsky bet 100,000, and Flack called. The river was the and both checked. Makowsky showed 9-2-x-x for two pair, and took the pot. A short break as we prepare for heads up. Daniel Makowsky limped from the button, Jacobo Fernandez raised to 200,000 from the small blind, and Layne Flack called from the big blind. The flop was the . Flack bet pot, Fernandez reraised all in, and Flack called. Flack had flopped sixes full of tens. Fernandez needed an ace or a ten, or he was done. The turn was the and the river the , and Fernandez was out in third place. Even so, another terrific showing for Fernandez has vaulted him to the top of the WSOP Player of the Year points race. Jacobo Fernandez raised to 175,000 from the button, and Layne Flack called from the small blind. The flop came . "Pot!" said Flack. Again.